Much has changed since Rocky was introduced almost four decades ago. Widowed Rocky Balboa (Stallone) still lives in the City of Brotherly Love. Rocky’s neighborhood looks unchanged from the first film. Nearing 70, Rocky still runs his Italian restaurant Adrian’s, named after his beloved wife (who died off-camera a few years before the last installment, 2006’s Rocky Balboa). The last person Rocky expects to make an impromptu visit to his restaurant is the illegitimate son of his former rival and long-deceased friend Apollo Creed. Die-hard fans recall Carl Weather’s Apollo was killed 30 years ago in 1985’s Rocky IV. Apollo’s son Adonis Johnson (Jordan) has lived a hard life. His birth mother died young (Adonis is the product of an indiscrestion), and he never knew his legendary father. In 1998 Adonis found refuge from a juvenile detention facility by Apollo’s widow Mary Anne (a winning Phylicia Rashad). She took Adonis into her home and raised him as her own son. Residing in Los Angeles and working at securities firm, Adonish cannot ignore his desire to follow in his father’s footsteps and pursue professional fighting. Mary Anne is adamantly against this, and she vocalizes some of the pratfalls she witnessed and experienced by being married to a heavyweight champion. Despite Adonis’s affection for his adoptive mother, he is unmoved and when L.A.’s elite Delphi Boxing Academy rejects him. He then tracks down Rocky and asks the legendary boxer to train him. The Italian Stallion has mellowed considerably with age, and the mourning champ we last saw in Rocky Balboa still lives a quiet life, especially now that his best friend and brother-in-law Paulie has passed away in 2012. Adrian and Paulie are buried side-by-side, and there’s a tender scene where Rocky goes to visit their graves. His relationship with his own son is strained, so Rocky ‘s lonely existence reluctantly persuades him to embark on the training journey with Adonis. The rigorous training takes place at Rocky’s old gym, and Coogler taps into this nostalgia beautifully by providing some breathtaking sequences of Adonis’s training in Philly. Adonis also meets a formidable and ambitious young singer named Bianca (the luminous Tess Thompson of Dear White People and Selma). One of the best and most poignant highlights of the Rocky saga was the exquisite romance between Rocky and Adrian. Remember how Adrian started off as an introverted, mousy recluse, and she ultimately emerged as the backbone of Balboa family? Bianca shares some similarities with Adrian in that she’s strong, confident, resilient, and vulnerable. Thompson is first-rate in the role. Coogler wisely observed the Adrian character, and he updated many of Adrian’s character traits while creating a fresh and interesting female counterpart to the film’s hero. Coogler’s impression of the Bianca character is superb, and Thompson realizes the role with truth and verve. She is a true original. Jordan has impressed me since I first saw him in HBO’s The Wire and 2012’s amazing sci-fi film Chronicle. I knew he was the real deal after seeing Fruitvale Station, and now he has exploded with a stunning leading man performance that should long provide him with the cream of the crop in terms of smart and intuitive scripts. In many ways, Coogler and Jordan have achieved the impossible: they have partnered to reinvigorate a much-loved film series and given it the shot in the arm it needed to stand on its own brilliant merits. All this being said, the performance in Creed that will leave you cheering the most is Stallone. Not only is this his best performance since the 1976 original, the range Stallone brings to the older Rocky is a triumph. There has never been a Rocky I disapproved of. Rocky II continued the story and gave audiences the payoff they deserved after two films with these characters. The third and fourth installments reflected the larger budgets when studios were more assured of big box office results (which they yielded; currently, Rocky IV is the biggest hit in the seven-film series). I recently watched Rocky V again, and all in all, it wasn’t bad. It’s my least favorite, but there were still solid moments, and Talia Shire’s final performance as Adrian knocked me out. Still, it did not click with audiences and critics, and Stallone resurrected Rocky Balboa, which helped restore the legacy. It words: audiences and critics were responsive. Both Stallone and Balboa are stripped of ego here – Sly has left his “baby” in the hands of a younger writer/director, and he has decidedly agreed to a supporting role. Moreover, Rocky Balboa faces challenges in Creed I will not detail here, and Stallone’s acting handles the role with aplomb. I would love to see Stallone win an Oscar for this performance. Yes, he’s that good. I forget how life teaches us that inspiration often comes with much sadness. Looking back on the events of the past six Rocky films, this life lesson seems to be a universal truth. 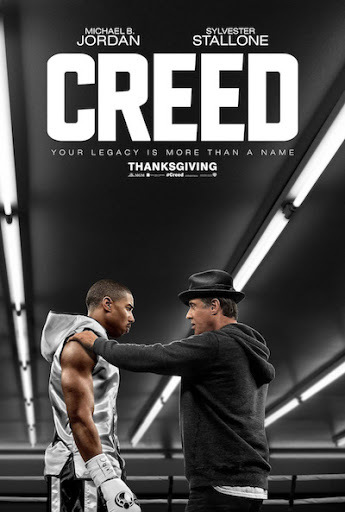 Creed left me cheering, tearful, and immensely moved. It is indeed one of the best films of 2015.